Tesla will report third-quarter earnings on Wednesday, ahead of schedule. Tesla could come close to posting its first quarterly profit since the third quarter of 2016. Revenue is likely to surge to a record level for the quarter. Tesla announced late Monday that it would report third-quarter earnings after the bell on Wednesday. That’s earlier than anybody expected – Q3 numbers were anticipated for the first week in November – and we can read two things into the abrupt advancement of the usual timetable. 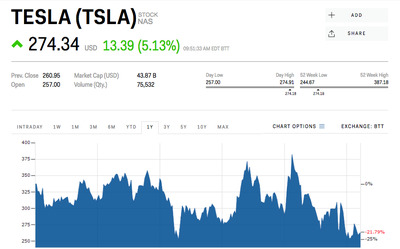 A consensus of analysts surveyed by Bloomberg figured that Tesla would report close to breakeven for the quarter: a loss of less than $US0.10 per share, versus a loss of $US2.92 in the same period last year on revenue of nearly $US3 billion. The first possibility is that Tesla lost money for the quarter, perhaps on much-increased revenue thanks to deliveries of its Model 3 sedan, so the company just wants to get the information out there and move along, given that CEO Elon Musk had predicted profits for the second half of 2018. Hello, fourth quarter! Up to this point, the markets weren’t really pricing in anything drastically positive. 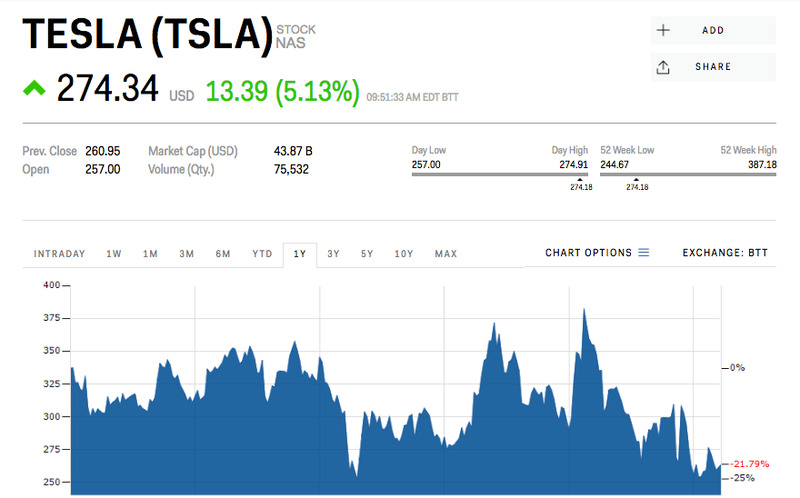 Tesla was at $US263 at the open on Tuesday, down over 17% for the year and well off its previous highs. But shares quickly jumped 5%, to $US274. The second possibility is that Tesla wants to get the modest-lost/breakeven/near-profitable story out there and set the stage for an actual profit in Q4. In any case, revenue for the quarter is likely to surge, potentially up by more than $US2 billion over Q2’s total of $US4 billion. One interesting factor to consider, given the markets’ prior wait-and-see stance, is that profitability for Tesla might be less important for investors than execution in the business, which would lead to the sort of growth that has given Tesla a market capitalisation of more than $US40 billion even as it builds and sells relatively few vehicles. Regardless, if Tesla does need to raise money in 2019, keeping a floor on its stock price of about $US250 would be beneficial – that’s roughly where the company has raised in the past.